Commerce on the Sacramento – San Joaquin Rivers dominated the early history of Contra Costa County. The rivers were a favored route to and from the booming gold fields and rapidly growing towns of Stockton and Sacramento. Along the northern shore of Contra Costa County pioneering steamships made Martinez, Black Diamond, Antioch and Marsh’s Landing important ports of call. One of the most famous of the early river steamers was the Antelope, first owned by the California Steam Navigation Company and later by the Donahue Line. The side-wheeler was one hundred and fifty feet long and carried a maximum of 300 passengers in cabins and steerage. 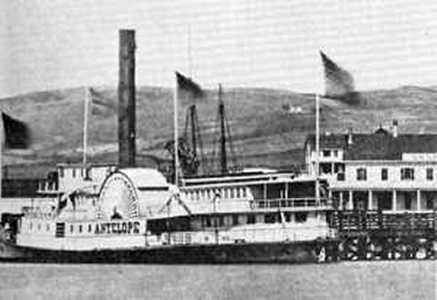 Aided by her sleek design and excellent captains, the Antelope gained a reputation as the fastest and most reliable steamboat on the early San Francisco to Sacramento run. The Antelope had a regular schedule that she proudly kept. She departed from San Francisco on Mondays, Wednesdays and Fridays promptly at 4:00 P.M. The Antelope would leave Sacramento at 2:00 P.M. the following day making the return run to San Francisco in the brisk time of eight hours. In 1854 Wells Fargo had a huge and growing problem. How could the express company efficiently and safely transport the flood of gold from the Sierra mines to San Francisco? Gold dust and bullion were pouring out of the hills by saddlebag, freight trains and stagecoach to Sacramento. The gold fields were filled with scores of cutthroats and highwaymen like the Tom Bell and Joaquin Murrieta gangs. Lone travelers were being killed and stagecoaches were routinely robbed. Once the gold had safely passed through the bandit-infested foothills, it was brought to the green, iron strong boxes of the Wells Fargo offices in Sacramento. It was decided that a fast, dependable steamship with an honest and respected captain was needed to transport the gold to San Francisco. The Antelope, commanded by its owner and master, Captain David Van Pelt, was an obvious first choice for carrying Sierra treasure to the mint, banks and East Coast bound ships waiting in San Francisco. Because of the Antelope’s speed and reputation for keeping to her regular schedules, she was a favorite of travelers including the famed Lola Montez. The Antelope was known up and down the river as a “lucky boat.” In contrast to so many of the early steamers, the Antelope never experienced an explosion or serious fire. Her speed, size and popularity enabled her owners to turn a profit greater than any other riverboat except the Senator, another early pioneer river steamboat and rival. The only major accident during her lifetime was her ramming in 1853 by the steamer Confidence in Suisun Bay during a dense fog. No lives were lost and the frightened passengers sustained only a few bruises. The river travelers were deposited in Benicia and from there boarded another steamer to complete their San Francisco trip. Inside the Antelope the there was constructed a unique Wells Fargo messenger’s compartment, which soon became known up and down the river as the Gold Room. The floor of the “treasure room” was heavily reinforced and braced to withstand the weight of the heavy shipments of precious metal. Accompanied by well-armed guards, over time the Gold Room carried millions of dollars worth of bullion down the Sacramento River, stopping in Martinez for passengers and then steaming on through the Carquinez Straits to San Francisco without ever losing a single golden flake to theft, robbers or accident. Her fame as a gold ship grew under the steady seamanship of such well-regarded captains as David Van Pelt, E.A. Poole, Albert Foster and Enos Fouratt. Often the Antelope was simply in the right place at the right time. Her dramatic rescue of the Washoe made newspaper headlines across California. On September 5, 1864 at 9:30 P.M., the Antelope was near Rio Vista when one of the Washoe’s boilers exploded with a roar heard up and down the river. The Antelope spotted the glow of distant flames and immediately came about and headed down river to the scene of the disaster. The Antelope found the Washoe engulfed in fire and covered with the horribly injured screaming in pain. Sixteen of the passengers were dead. Another thirty-six were badly injured and fifteen were slightly hurt. Most were scalded and burned. The dead and wounded were brought aboard and the Antelope attempted to steam at top speed to Sacramento. Unfortunately in the dark, she soon rammed into a hidden mud bank. The Antelope struggled to free herself for almost two hours before escaping from the mud bank. It was 4:30 A.M. before the injured reached the emergency hospital on J Street. It was there that the Washoe’s Chief Engineer finally died while cursing the faulty boilers that killed him. Other ship owners were jealous of the speed and reputation of the Antelope. Bigger paddle wheelers like the Nevada would intentionally crash into her sides sometimes smashing part of her railings to kindling. Peter Donahue even went so far as to expressly construct a steamer, the Sacramento, with the stated purpose of beating the Antelope. The Sacramento first challenged the Antelope in a classic river battle that began with angry passengers checking their revolvers and ended with the Antelope ramming the Sacramento and pushing her broadside down the river for a short but embarrassing distance. Historically one of the most famous achievements of the Antelope, was her selection to carry the first Pony Express mochila or saddlebags from San Francisco to Sacramento and from Sacramento to San Francisco. Billy Hamilton carried the first westbound mail pouch down the Sierras back to Sacramento. On the morning of April 13, 1860 flags were flying all over Sacramento and the courts were adjourned for the day. Late in the afternoon the Pony Express rider, his horse and the mail pouch, boarded the Antelope. The impatient Antelope fired up her boilers and rapidly steamed the remaining one hundred and twenty five twisting river miles arriving in San Francisco close to midnight. Large crowds on the San Francisco wharf met the steamer. A spontaneous parade formed with several units of the volunteer fire department leading the celebration. The band played “See the Conquering Hero Comes.” At the end of the procession rode Billy Hamilton on his mount followed by hordes of cheering (and very drunk) citizens. The Antelope was a grand old lady to the very end of her life. Peter Donahue admired his old rival so much that he eventually bought her. By 1871 the aging Antelope was leading a sedate but productive life on San Francisco Bay. Her legendary days of fires, races and rammings were now memories, part of the lore of the river. In 1884 the Antelope was being used as a ferry between Tiburon and San Francisco serving the Donahue Line. However time was rapidly running out for the tired, old steamboat. After all, her timbers had first been laid long ago in 1849. In 1888 she became lost to history forever. The Antelope was sent to Wreakers and the famous “Treasure Ship” of the California gold rush and mail ship for the Pony Express was broken up and sold for scrap. Boessenecker, John, 1988, Badge and Buckshot: Lawlessness in Old California, Oklahoma Press, Norman, OK.
Dillon, Richard H., 1959, Embarcadero, Coward-McCann, New York. Harlan, George H., and Fisher, Clement, 1951, Of Walking Beams and Paddle Wheels, El Camino Press, Salinas, CA.